Mid Day Meal Scheme, Hojai. Applications in Standard Form (Assam Gazette Part-IX) are invited from eligible candidates for one (1) position of Electronic Data Processor (EDP) under Mid Day Meal Scheme on Contractual Basis for the period of 11 months which will be extended depending upon the performance for implementation of Mid Day Meal programme in Hojai district. Eligibility Criteria: Graduate with minimum one year Diploma in Computer Application/DTP from reputed institutions or Diploma in Computer Application from IT] or three years diploma from Polytechnic and one year experience in relevant field. Pay: The monthly remuneration will be of Rs. 10000/- (Rupees Ten thousand only) per month. 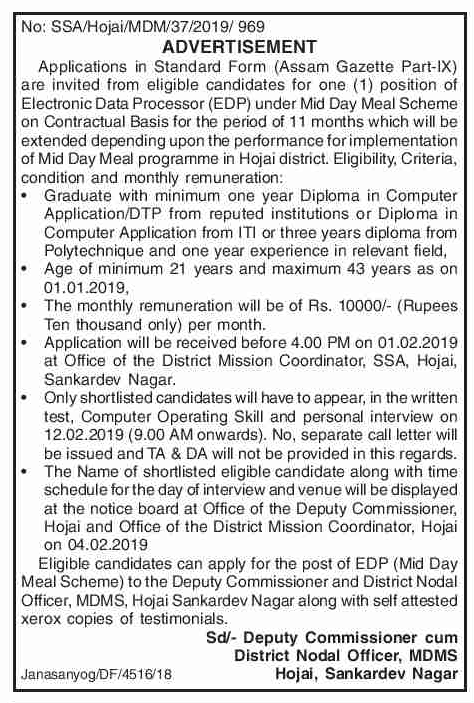 How to apply: Application will be received before 4.00 PM on 01.02.2019 at Office of the District Mission Coordinator, SSA, Hojai, Sankardev Nagar. Only shortlisted candidates will have to appear, in the written test, Computer Operating Skill and personal interview on 12.02.2019 (9.00 AM onwards). No, separate call letter will be issued and TA & DA will not be provided in this regards. The Name of shortlisted eligible candidate along with time schedule for the day of interview and venue will be displayed at the notice board at Office of the Deputy Commissioner, Hojai and Office of the District Mission Coordinator, Hojai on 04.02.2019. Eligible candidates can apply for the post of EDP (Mid Day Meal Scheme) to the Deputy Commissioner and District Nodal Officer, MDMS, Hojai Sankardev Nagar along with self attested xerox copies of testimonials.